I am building my recipes as I go. It feels quite funny. Yesterday I thought I’d make roti and subzi. So I chopped onions and cabbage with the intention of mixing it with the flour for dough to make a two-in-one one dish meal supplemented with salad and curd. Then I chopped tomatoes, capsicum and cucumber for my salad. As I admired my chopped veggies sitting in the large bowl looking colorful and cheerful, a thought struck me. Why make dough when I could simply make batter and make dosas instead? Less work and no less nutritious. So I took two tablespoons of multi millet atta (yeah, my new gluten-free, diabetes-friendly love) and dissolved it in a little water. Then added the onions and cabbage to it. On second thoughts, I put in the tomatoes and capsicum as well. The more, the merrier I thought! Cucumber makes a very good standalone salad anyway, right! I added a pinch of salt, turmeric powder and chili flakes to the veggie batter and let it sit for 5 minutes before heating the griddle and making three dosas for myself. It was yum, I say! The onion really makes all the difference. I had it with a cup of curd and the salad. Vidur has a good laugh when I tell him what I ate every day. Some days when I stack the pressure cooker with sprouts and veggies, it carries over for two days. I make four different dishes so it doesn’t seem like the same thing. No “repeatays”. Makes sense and saves energy too. You know how I enjoy eating salt-less stuff. It is all working out for me. Two weeks in Mohali really freaked out my blood sugar levels and I am working hard to bring it back to acceptable levels. I am also due for my check up, which means I must go for my list of blood tests. All in good time. I am also clearing the pantry, roasting, cleaning, discarding. I cried when I saw the arrabiata sauce but smiled when I saw it was valid for 12 months as that meant Vidur would be able to enjoy it when he comes home for the hols. 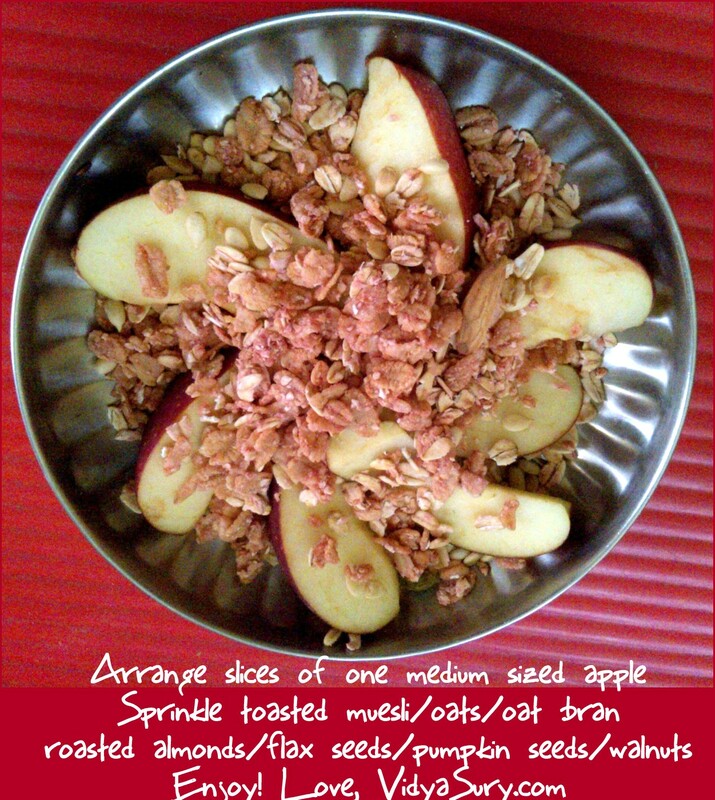 One of my favorite go-to snacks these days is chopping up an apple, sprinking it with pumpkin seeds, flax seeds and muesli. Filling and healthy and of course, tasty. Important eh? I love sprouting methi seeds (fenugreek) and eating them with curd. Very dessert-like, I think! I soak two spoons of methi seeds in a glass of water at night before I go to bed and drink the water in the morning as soon as I wake up. THen I drain the soaked seeds and let them sprout. They almost taste sweet when they are fully sprouted. I would go for dosa over a salad any day! My reasons being that the former is more appealing to my palate. Methi with curd sounds like a good idea for a dessert, yet to try it though. I love recipes that evolve as we go along. Creativity in the kitchen gives me quite a kick too. The muselied apples seem yummy!